An interview with director Kazuki Akane regarding the Noein TV series. He discusses various aspects of the show, including, most interestingly, the production delays the series experienced. He attributes them to what he describes as both a “tug-of-war” and a “fight” with the character designer to get the artstyle he and the team wanted. Given Takahiro Kishida’s record (even just up to 2006), I think it’s less likely the beef there was with him specifically and more likely it was with one or more higher-ups. Oh, and there’s also some stuff from him on the respective pluses and minuses of TV and movie anime. Please don’t be the guy who links this article as decisive evidence that Noein failed to sell disks because of such and such a reason. People who look at sales numbers with any kind of regularity should know better than to just assume that any one reason causes people to buy or not buy a show en masse. That said, while I love very much the way the series turned out, I can’t blame whoever was pushing more moe character designs for pushing something they thought might help sales. 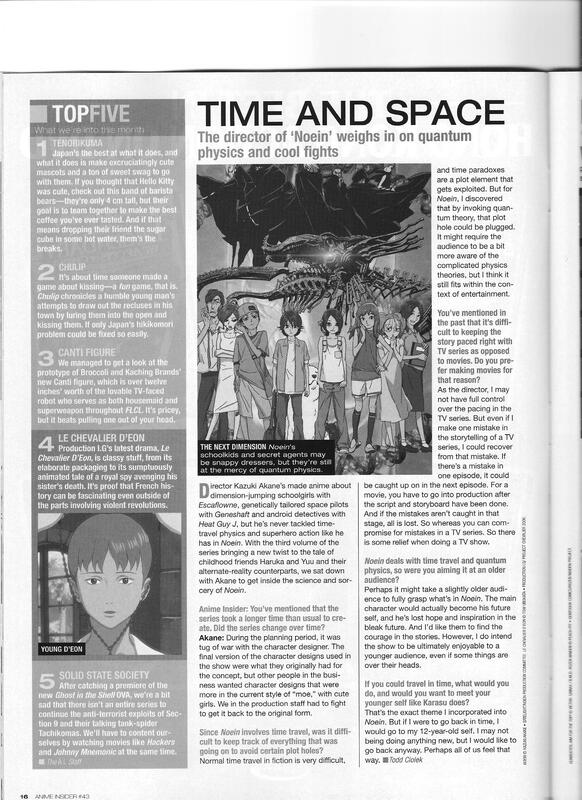 This entry was posted in Old Magazine Articles and tagged Anime, Borderline Plagarism for the Freedom of Information, Kazuki Akane, Noein, Takahiro Kishida by torisunanohokori. Bookmark the permalink.